Roasted Chicken and potatoes basted with buttermilk ranch (much like Million Dollar Chicken). This whole meal cooks in one pan! I kept seeing Chef Dan Silverman’s recipe for Million Dollar Chicken (as featured by Ina Garten on Food Network) popping up on recipe sites and Pinterest. It’s a whole roasted chicken glazed with crème fraiche and lemon juice. It looked DIVINE and I wanted to make it but I always keep y’all in mind when I’m cooking stuff and I get the feeling most of you don’t keep crème fraiche in your Frigidaire. So then I got to thinking about white barbeque sauce and how beautifully it glazes chicken. And then I got to thinking about buttermilk ranch dressing. Because it’s kinda like a combo of the two. Sort of. Well, the crème fraiche glaze is cream based and the white barbeque sauce is mayo based and buttermilk ranch dressing is both (buttermilk and mayo). So that's what I decided to use. Million Dollar Chicken roasts on slices of day-old crusty bread which soak up all of the pan drippings and makes for probably the best crouton in the history of the world ever. I decided to employ the same idea of using the pan drippings but instead of bread, added potatoes to the pan. The potatoes soaked up all that chicken goodness and when everything was done I had an amazing one-dish wonder. Winner, winner chicken dinner, y'all! If you like this one-pot wonder, you might also enjoy this recipe for One Pot Paprika Chicken Thighs! Add chicken, olive oil, salt, garlic, onion powder and peppers to a large bowl and toss to coat. Really get in there with your hands and massage those spices into the chicken. Spray one large baking pan (18x13) or two smaller pans (13x9) with cooking spray or rub with a little olive oil. Arrange chicken pieces evenly in pan(s) and bake at 325 degrees for 45 minutes. Meanwhile, clean potatoes. Leave the smaller potatoes whole and cut the larger ones in half. You don’t want anything bigger than 2” in diameter. Remove pan(s) from oven. Arrange potatoes evenly around chicken pieces. Return pan(s) to oven and continue cooking for 30 minutes. Remove pan(s) from oven. 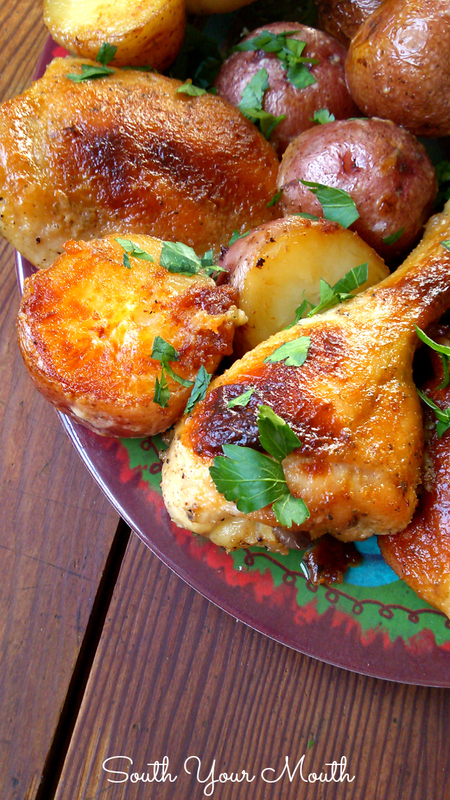 Baste chicken and potatoes with buttermilk ranch dressing. Sprinkle potatoes with a little coarse grain salt. Return pan(s) to oven and continue cooking for 30 more minutes. Remove pan(s) from oven. Increase oven temperature to 375 degrees. Baste chicken and potatoes with buttermilk ranch dressing again. Return pan(s) to oven and continue cooking for 20-30 minutes or until chicken is golden brown. OK, in summary, here are the cooking temps/times. Because if you’re like me you’ve already seen a squirrel and forgotten which step you’re on. 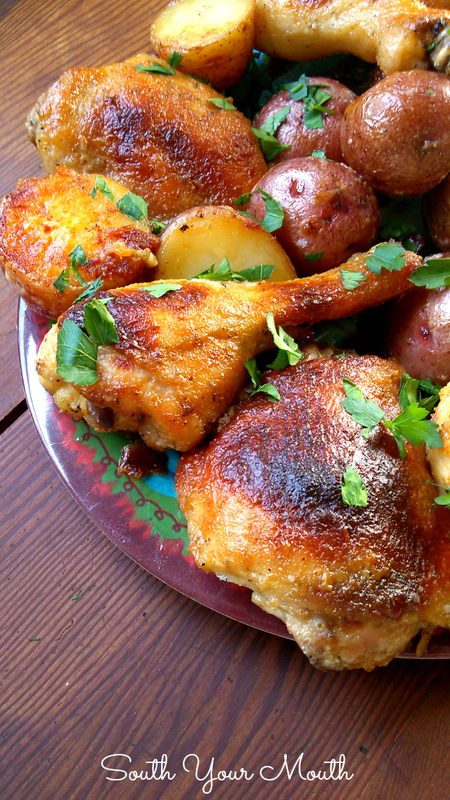 Arrange chicken and potatoes on a serving platter to serve. Garnish with fresh chopped parsley if desired. *Make sure you buy an actual buttermilk ranch dressing (such as Newman's Own). Check the ingredients list to be sure buttermilk is one of the top three ingredients. Do not buy light or fat free dressing. TIP! To get those gorgeous caramelized potatoes, place them cut-side down (face down) in the greased pan. Don't flip or turn them - just let them do their thing. Use a sturdy spatula after they're done to make sure you don't lose any of that golden deliciousness! This looks amazing! I just wanna reach through the screen and grab it! When you say real buttermilk ranch dressing, do you mean the shelf stable kinds like the big K, or HVR, or do you mean the refrigerated kind? Thanks! Hi there. What to do if you can't find a dressing including buttermilk? Could I use real buttermilk as a % of the dressing with a range dressing as balance? HELP! You could buy the powdered mix (that calls for buttermilk and mayo) and make it yourself I suppose. This looks so great! If I would cut the recipe in half should I change the cooking times? No, cook everything the same. Good luck! Can you do this with chicken breasts also? I think breasts wouldn't be as moist but you could try it. Just be sure they're not boneless or skinless. I just made this with a mix of the quarters and breast and it was amazing. This recipe is a keeper for sure. So yummy! 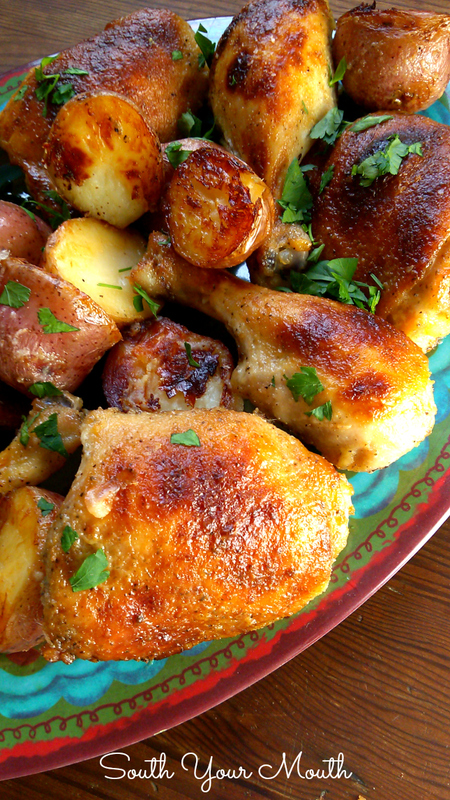 Thank you so much for posting several recipes that use whole chicken thighs. With the price of beef and pork lately, chicken thighs are the only meat I can really afford to buy, and my family is more than a little tired of chicken casseroles and other shredded chicken recipes. I can’t wait to try your recipes and bring more variety to my kitchen! This looks amazing!! Is there a crockpot version? I don't think this could cook well in a crock pot. Sorry! Do you get the butter milk dressing in the package and follow recipe on package or do you use the dry seasoning? I used the already prepared kind in the bottle but you can certainly make it from a packet. Either way, we're using prepared dressing, not the dry mix. I made this last night and it looked exactly like the picture! How often can you say that? It also tasted as good as it looked. My son said the only problem was having to wait so long to eat once the wonderful smell started filling the house. Love your site and so does my family! That might be one of the best compliments I've ever gotten :) Thank you for taking the time to let me know! I made this the other night and it was amazing! My 7 year old said it was the best chicken I ever made and I need to make it more often! Thank you so much for the recipe! You're welcome! I'm so glad y'all enjoyed it! I'm cooking this for my family on Friday since I have the day off and plenty of time to devote to this wonderful looking recipe! :) Thanks! Should the chicken be covered with foil while baking? Can you do this with a whole chicken? The directions say to add the peppers in with the chicken....but the ingredients do list peppers, are their peppers in the dish? thanks! Would you add time and/or increase the temperature for chicken breasts? I really think dark meat works best with this recipe but if you'd like to try breasts, use bone-in, skin-on pieces. They won't need to cook as long so maybe reduce the first cook time (45 mins) to 30 minutes. Good luck! Well I guess I should have read all these comments before I started.I have the boneless skinless chicken breast in the oven right now one more basting left. Smells wonderful I will let you know how it turns out. Did you cover your pan while in the oven. The picture is what grabbed my attention. I printed this off and am going to try it this week. I like dishes that use legs and thighs of a chicken. Very economical... I noticed one of the cut side of a potato looked like it had a nice char on it. I assume that is from turning it upside down in the pan like you said? It almost looks like it has cheese on it. Yep, that's just what happens to the potatoes when they cook low and slow face-down on the pan without being disturbed. Isn't it beautiful?! hey Mandy, I just put the chicken in the oven. My question is, do I use different ranch dressing or the same ranch mixture I coated the chicken with when I coat the chicken and potatoes? You can use the same. If it's the contact with the chicken you're worried about, it will have plenty time to cook through. Thanks for getting back to me so quick. Thinking about doing a Julia Child with all your recipes. lol I love your site and you. I'm so impressed. Thanks again. Use any pan(s) you have with sides to keep the pan juices in that will hold everything in a single layer. Skin-side up! What brand did you use as Hidden Valley's Buttermilk is not in the top three ingredients. I used a store brand but I've been paying attention since I created this recipe and Newman's Own has real buttermilk too. Isn't it something that Kraft and Hidden Valley don't use the better ingredients and that the store brand did? Ya just never know! Thank you for the speedy reply as this is what we are having for dinner! 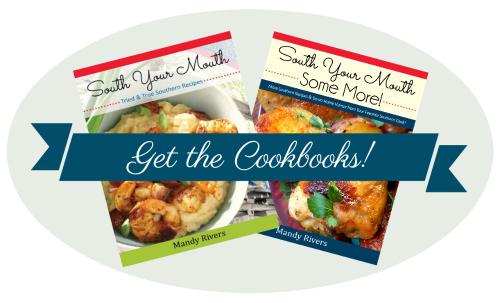 HI Mandy - I recently discovered your blog and have enjoyed several of your recipes thus far! I tried this recipe today and we LOVED the chicken! Unfortunately the cut side (down on the pan, of course) did not brown at all. I'm guessing this was due to the amount of fat that rendered from the chicken pieces? When I put the potatoes in after the first 45 mins I did not notice any "juice" in the pan. But when I pulled the pan out for the first basting there was alot of "juice" in the pan. Should I have tried to get this out of the pan? You didn't mention anything like this in your recipe and your other commenters didn't mention this issue either. I was careful to follow your directions...any thoughs? Thanks!! Hello I was just wondering if you are suppose to put the ranch dressing on when you coat the chicken with the spices or after it has been for the 45 minutes? No, chicken only for the first 45 minutes. I made ur recipe exactly and it was delicious! Only I did remove the skin from the chicken because one, we don't eat the skin and also I rather the dressing be on the thigh itself. Also, for diet reasons I did not use potatoes instead I used brussel sprouts and carrots. After the first baking was a lot of chicken juice which I drained and this came out very good. Will make with potatoes when I have the whole family over. Very nice website, thank you. This looks so delicious! Thank you for sharing this recipe. Tonight's going to be the second time I've made this recipe. The first time I made it, it was GONE in no time fast! I'm going to try doing bread instead of potatoes...wish me luck! Love, love, LOVE your recipes! Since finding you a couple of months ago, I've made many of your recipes and all have gotten rave reviews from my family and friends. In fact, my macaroni and cheese is now being replaced by your crockpot version...they keep begging for it! You are now my go-to lady when I'm looking for a recipe! Thank you for all your hard work keeping this site going...I know many folks like me are really benefitting from it. This looks absolutely delicious, and everyone that has made it has loved it, so I know you must be onto something! But, I am just having the hardest time imagining chicken in the oven for over TWO HOURS!? Even at 325 (most of the time), and even with thighs, it is hard to believe it wouldn't get dried out. You've really never had it seem overcooked? I almost always cook dark meat low and slow just like this and have never thought it was overcooked. It has to be bone-in, skin-on pieces, though. I made this recipe this weekend and it was awesome!! I did need to bake it a little longer, it could be I cut the potatoes a little bigger but it was so good, I couldn't believe I made it!!! I also had the issue of the drippings being a little too much like too much broth so I just drained most of it out, the second baking trip in the oven made more drippings so it worked out... I took it out of the oven and wasn't sure how to serve it -- I'm not a cook! -- I never got that far.. lol I was so proud!! Thank you Mandy!! So, if use boneless (because that's what I have right now), do I cook a shorter time? I'm so excited to try this one!!! I love "Don't buy light or fat free dressing". This should be just general advice :-) You don't want the crap they put in there to replace the fat and now you have a good reason to do some kind of exercise. Even if it's walking around the block during the first round of baking!!! I would skip the first 45 minutes of cooking. thanks was wondering this myself because boneless is what I have too. sounds delicious. I just really don't think this is a recipe you could make with just your top element :( I wish I could help you but it needs to slow roast. If you do try it, let me know how it turns out! The chicken turned out great, although it wasn't brown all over like your picture. My two test tasters told me not to change a thing! I'm still planning on making this for 25 people this Saturday. Wowza! Now, that I know what I'm doing more or less, I'll be able to tweak it for my cooking tools. I made this for dinner last night and can't get over how amazing it was! My husband said it was the best chicken he ever had. Even my picky two-year-old loved it! I used drumsticks and bone-in, skin-on chicken breasts… Followed the recipe to a T other than that and it turned out perfect! Thank you so much sharing! I'm confused when you say baste... do you mean up until now the ranch has not been used and to put the ranch onto the food? how so with a brush? The ranch goes on after the first 45 and 30 minutes of baking time has passed (75 min total). I baste with a brush. I bought a regular bottle of Hidden Valley Ranch. It does list buttermilk as an ingredient. Will that be fine to use, or do I need to buy bottle of Hidden Valley Buttermilk Ranch? I made this recipe exactly as printed. The potatoes were wonderful. The chicken pieces were so dry I could hardly eat them. Too much heat for too long. Did you use bone-in, skin-on thighs and legs? I've had it once, and I'm having it again. I love this dish. If you are reading these comments, wondering if you should try it- do it! I've made this several times and it always comes out great! That's why I'm cooking my own Mother's Day dinner today cus I want this!! Thanks, Mandy, for the yummyness!!! This is the best chicken and potatoes I've had in my entire life! My son, who hates any chicken that isn't breaded and fried, enjoys this recipe! Sooooo delicious!! I can't wait to try this recipe. My family and I have loved so many of them. I put your cookbooks on my Amazon wishlist, I hope to get them soon. How does this do in cast iron? Or should I use a different baking pan? Wow Mandy, this was fantastic! Tried it last weekend and it was a total hit, even with my kids...when my 13-year old daughter reached for a THIRD drumstick, I knew I found a winner! Thanks for taking the time to experiment and come up with a knockout! Thanks also for the heads-up on buttermilk ranch salad dressings. For any of your readers that can find Ken's Steakhouse salad dressings in their local market, buttermilk is listed as the second ingredient. Mighty tasty salad dressing too! And, your new book? Beautiful! I've found so many recipes I can't wait to try. Keep 'em coming! I know this is going to sound weird but does this taste 'ranch-y'? It looks so amazing. I love dishes that call for ranch because it adds so much flavor but my husband absolutely hates anything Ranch. grrr If he knows it's in there he won't go near it. I do sneak it (and sour cream...and cream of mushroom soup. Feel my pain.) in often if I know the ranch flavor will be absorbed. In reading all the comments it seems even picky eaters love this recipe so I'm hoping I'll be able to add it to my short list. Thank you!! Wow! Since I am too arrogant and hardheaded to follow a recipe exactly, I soaked my chicken in butter milk for 12 hours, in addition to bone-in legs with skin, I also used boneless skinless breasts, and I added carrots. This recipe was so perfect, that I couldn't even mess it up with my changes. This was over the top good. BTW: the carrots were also great. I added them with the potatoes and treated them the same way. Fabulous Recipe! Made it again tonight with Cornish Game Hens, potatoes and carrots. Probably should have reduced the time a little, but it was still great. What a wonderful recipe. I'm becoming a Mandy Rivers fan. were the boneless skinless breasts dry? Just came upon this recipe as link from Southern Plate. I have used many of your recipes and have never been disappointed in any. This sounds so delicious and has so many good comments, and I can hardly wait to get to the store to buy chicken to make it. Thank you for giving us so many good things to eat. Hi Mandy, can I add thick sliced Vidalia onions? Making this right now and it smells delicious!! We got the lighthouse ranch dressing from the refrigerated produce section. Works great! I have actually made the Ina roast chicken on the bread. She serves it with arugula as a salad. The croutons are amazing. This looks amazing too.